Here we are going to learn about buffer capacity chemistry definition and formula. The buffer capacity is a quantity in resisting the pH change at the time of addition of an acid or base. The higher the acid concentration of the buffer then the buffer capacity will be higher as well. The buffer capacity can also be defined as the amount of mole of strong base needed to change the pH of 1 L of solution by 1 pH of unit. In preparing a buffer solution with a controlled pH it is preferred to choose an alkaline salt or an acid salt whose pKa value of the acid or base is as close as possible to the controlled pH so that a maximum value may be obtained upon the rise or fall of the pH. The concentration of the acid, base, and salt used depends on the buffer desired to change the value of the pH. From table 1 it can be seen that the basic compound can increase the pH twice in concentrated solution (concentration) from 3.79 to 4.74 than in dilute solution. 1. To prepare 100 mL of buffer solution with pH 5, then acetic acid, formic acid, benzoic acid and salt salt are used. From that option, which acid should be used to obtain the maximum buffer value against the increase or decrease in pH? (read also Different Types of pH meters) and what is the acid-salt ratio to be used? It is seen that the pKa value of acetic acid has a value close to the pH of the buffer. Therefore, Acetic acid and its salts are used in this calculation. 2. If Sanikun wants to change the buffer pH on the practicum but Sanikun does not want the value of the change to be no more than 0.1 unit for the addition of 1mmol of acid or alkaline. What is the acid concentration and salt value that Sanikun should use to make the lab work? Since acid has fewer values than salt, a very high pH change will occur if Sanikun adds a base. Thus, if Sanikun calculates based on the addition of alkaline, then he will not get a value close to 0.1 therefore, it would be better if he added an acid. Strong acid and base solutions can make very high pH changes and can provide flat titration curves at wide pH range (figure 1). The solution can be used to keep the pH value to remain at a low value or at a high value. For example a 0.1M HCl solution may be used as a buffer solution at pH 1. 100mL a solution containing 10 mmol H3O and added with a solution containing OH-1mmol may cause a pH change of about 0.05 units. Strong acids and bases also can experience very high pH changes despite dilution is done. For example, if 100 mL of water is added to 100 mL of HCl 0.1M [H3O] will make the pH change from 1 to 1.3 otherwise the pH of the buffer that is used with the conjugate acid alkaline pair is not theoretically dependent on the volume of the solution because pH depends on the alkaline ratio per salt according to the Henderson-Hassel Balch equation. Very high pH changes at the time of dilution can occur if the concentration in the buffer is below 0.0001 M at these concentrations and the smaller ones can cause the water molecules break out. However, in making a buffer solution it is seldom even none use such a low concentration because it has a very low buffer capacity value. The uncertain constant value of dissociation of weak acids and weak alkaline. There is a simplification of the comma value the calculation cause rounding. That is the material and science of buffer solution (Buffer) The benefits of knowing buffer solution is to facilitate the alkalimetry titration process and open the knowledge of science either directly or indirectly. 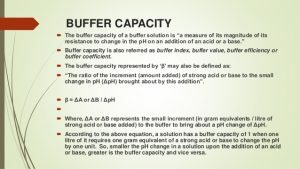 Thus, that’s the complete explanation about buffer capacity chemistry definition and formula. What is the Study of Harmful Effects of Chemicals on Humans and Other Organisms? A-Z List of Harmful Chemicals to Pregnancy – Things to Aware!